You would always find the need to resize images or pictures, for sharing them through web pages or emails or any other media. However, you would also want the image to retain its original quality, irrespective of the resizing. 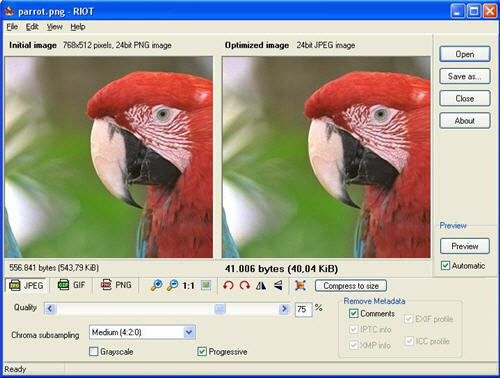 RIOT, also known as Radical Image Optimization Tool, is a free image resizing software, that lets you resize images without any loss of quality. 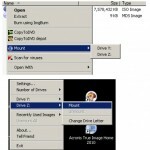 You can resize images of any popular format including JPG, GIF, PNG, TIFF, BMP, PSD, ICO, RAS, HDR etc. The image resizer has all the essential tools like Pan and Zoom, Rotate, Flip etc. RIOT supports various JPG, GIF and PNG image optimization settings and the developers have promised to include more features in future. With RIOT, you can reduce any picture to one-fifth of its original size, without any significant loss of quality. However, you must save your changes before closing the program, because it won’t display any warning message or save the image automatically, if you quit the application. Hope the developers include appropriate warning messages in future versions. RIOT is available in English and German and works on windows XP or Windows vista.Free download RIOT from here and enjoy image resizing without loss of quality.